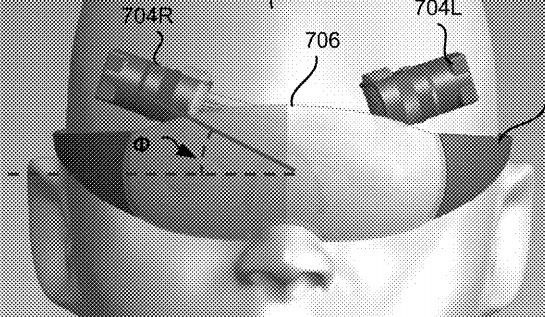 The patent application, filed on October 1, 2018, describes a head-mounted AR display device that consists of a frame holding a combiner, a curved, transparent apparatus for displaying cloud-hosted AR content, and a micro-display for projecting AR content to the combiner. The device also includes the typical sensors, such as an inertial measurement unit (IMU), found in modern AR headsets. The patent is attributed to inventor Ozan Cakmakci, the lead optical engineer for Google's Project Glass team, which produced the original Google Glass device. 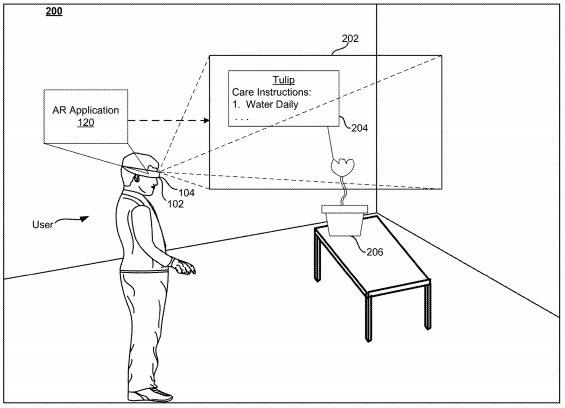 However, the capabilities of the AR headset described in this filing appear to go beyond the heads-up display functionality of Glass and approach the spatial computing realm of the HoloLens and the Magic Leap One. "The immersive augmented environment can be generated by superimposing computer-generated content on a user's field of view of the real world. For example, the computer-generated content can include labels, textual information, images, sprites, and three-dimensional entities," writes Cakmakci in the application. "These images may be displayed at a position in the user's field of view so as to appear to overlay an object in the real world." 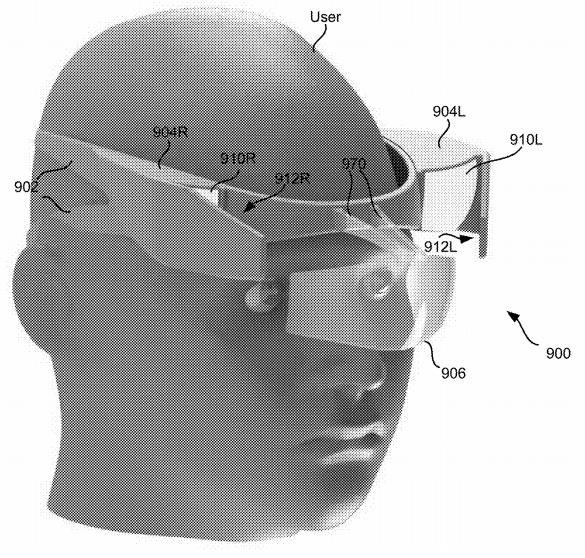 The application is packed with potential designs for AR headsets with the combiner and microdisplay system. The headset design in one drawing in the patent application ("figure 9," shown below) vaguely resembles the open source design of Leap Motion's Project North Star headset. Last May, documents from contract manufacturer Quanta revealed the existence of Google A65, a wireless headset powered by Qualcomm's QCS603 chip. Since then, Qualcomm has introduced its Snapdragon XR1 chip made specifically for AR wearables, which was also linked to a potential Google headset. More recently, Qualcomm revealed that its Snapdragon 855 chips would enable smartphones to act as tethered computers for smartglasses like the Nreal Light. It just so happens that Google's patent application mentions a connected smartphone as one method for providing computing power for the AR headset. 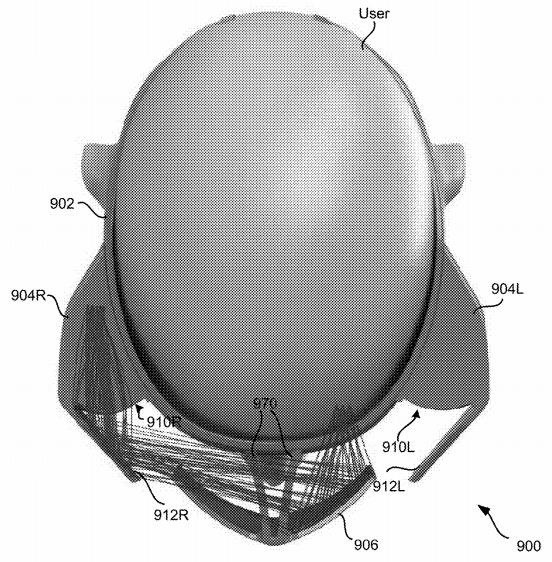 Between the inventor's pedigree related to an existing AR product, reports of AR headsets under development at Google, and Qualcomm's involvement with both Google's wearable and in the general mobile market, this patent appears to have a better chance than most patents of eventually, possibly, becoming a real product.